History: After starting his musical journey as a trained trumpet player and rock guitarist, Clif began his studio career at the legendary Ocean Way Recording in Los Angeles in the mid 1980's . Throughout his years there as a staff engineer, Clif honed his skills while working with superstars like Bruce Springsteen, Prince, the Beastie Boys, Van Halen, and many others. He also learned his craft by working under such legendary producers and engineers as Arif Mardin, Glyn and Andy Johns, Norman Granz, Al Schmitt, and many other top contemporary producers. It was also at Ocean Way where Clif began working with producer/engineer Scott Litt, on the platinum debut album by Indigo Girls, starting a long working relationship, collaborating on over ten albums, including R.E.M. 's classic "Automatic for the People". Clif has produced and/or engineered many other high profile artists including No Doubt, Weezer, Jeff Buckley, Jewel, Brian Setzer, Faith No More, BT, Rush, The Replacements, John Hiatt, the Jayhawks, Henry Rollins, The Refreshments, and Saliva, as well many other critically acclaimed indie/alternative acts. Clif has also spent a lot of time in England working with such British mainstays as All Saints, Skunk Anansie, Echo and the Bunnymen, Mansun, and Beth Orton, among others. His work has also taken him Ireland, Wales, Canada, Holland, Belgium, Russia, and Australia, in addition to every corner of the United States. He mixed in 5.1 surround a new Sting track featuring Herbie Hancock for the Japanese movie “Ashura” soundtrack. 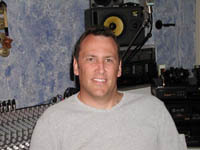 Clif produced the debut album for electronica/pop artist The Lovemakers on Interscope. He recorded and mixed for singer/songwriter Courtney Jaye on Island Records. Clif engineered for legendary Billy Idol album on Sanctuary Records. Clif also recorded and mixed a beautiful album for new artist Kate Earl (Warner Bros) featuring members of Incubus, David Baerwald, Wendy Melvoin, and many other guest artists, in the vain of Norah Jones and Fiona Apple. Clif also mixed the new CD from Scandinavian Superstars The Rasmus, which is now multi-platinum in many European countries. He also mixed a new album for pop-punkers The High Speed Scene for the Neptunes’ label StarTrak. Clif has also worked with Paul McCartney, Macy Gray, Dave Mustaine, and All-American Rejects. Current credits: Clif recently returned to Europe to engineer Sting's upcoming album at his estate in Italy. Meanwhile, the album Clif produced by Dutch superstar Anouk has gone triple platinum in Holland, and double platinum in Belgium, with a release for the rest of Europe planned soon. Clif also produced an outstanding debut album for a London UK band called The Noisettes at the legendary Plant Studios in Sausalito. The Noisettes are signed to Universal/Motown Records and are making a huge impact in the UK with their ultra original blend of jazz and punk, recently winning a BBC contest and getting rave reviews. Clif mixed The Noisettes as well as some other recent projects at his newly revamped personal studio, including a single for Shaggy, a single for pop/electronica band The Lovemakers (Interscope), and a new album for the Dutch hard rock band Green Lizard.